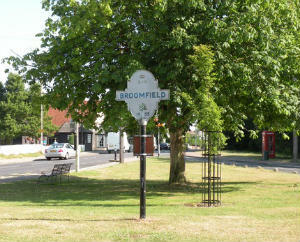 There has been a Methodist Church in Broomfield since 1911. The present church is situated on the main road (A131) from Chelmsford towards Dunmow. The present Church was built in 1963 and refurbished extensively in 2006. At Broomfield Methodist Church we pride ourselves on being a friendly welcoming Church that is "Seeking to love and serve God in the community and in the world". We run activities for Children throughout the year, meet together in fellowship and in house groups throughout the week and support community activities in the village who use our buildings. "Seeking to love and serve God in the community and in the world"
If you are new to Broomfield or are a new Christian seeking a spiritual home we welcome you at any of our events or services. Our Church minister, Rev Mike Lewis is also Superintendent of the Chelmsford Methodist Circuit. If you would like to arrange Baptism, Marriage or funeral please contact him. Alternatively you can contact one of the Church Officers ( see our 'Contacts Page') or simply visit us on a Sunday Morning at 10.30am when you will receive a warm welcome. Stay for a coffee after the service so we can get to know you better.